Are you being asked to float in an area outside your specialty? How about stepping in to help out on the Rapid Response team when necessary? How do you feel about it? Do you see it as an opportunity to learn something new and fill in when needed? Or, do you feel it puts the patients at risk because of lack or training? Please read this article and let us know your thoughts. 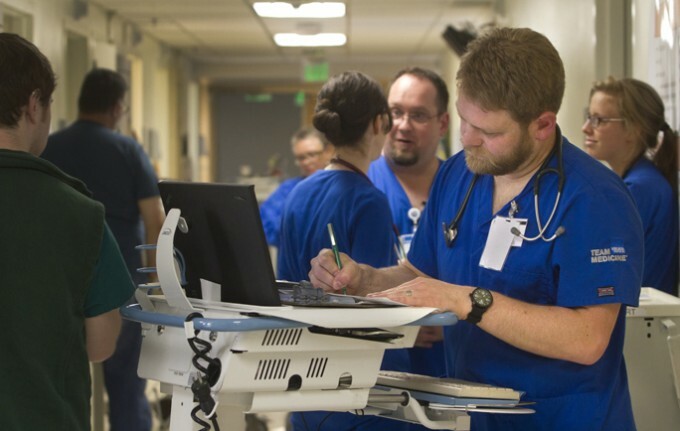 A recent Medscape article addressed a reader's question about whether a hospital could require critical care registered nurses (RNs) to cover shifts on their hospital's rapid response (RR) team. RR teams rely on hospital staff with critical care expertise to provide bedside assessment of non–critical care patients who appear to be deteriorating. RR teams can differ in their makeup and typically consist of a "physician and nurse, intensivist and respiratory therapist, physician assistant alone, critical care nurse and respiratory therapist, or clinical specialist alone." As many as 84% of patients who have a cardiac arrest demonstrate clinically identifiable signs of deterioration in the 6-8 hours before the event, and identifying changes in a patient's condition early can often be the difference between life and death. Failure to recognize a patient's deteriorating status and intervene is known as failure to rescue, and although it does not necessarily mean that a patient's caregivers have been negligent, it does represent missed opportunities to prevent potentially catastrophic outcomes. The original question (above) noted that the nurse's manager said nurses needed only a brief orientation to function on the RR team. The reader asked whether the hospital could force nurses to serve on the RR team. Carolyn Buppert, MSN, JD, author of the article, responded that critical care nurses are a good choice to be RR providers, and hospitals can require them to participate on RR teams. But, she wrote, "Each nurse needs relevant education and supervised experience to feel adequately prepared to provide the care the hospital assigns." My first experience as an RR nurse was having a bag, a cell phone, and this role thrust upon me. I had a caseload but another nurse would "watch over my patients." Even as an experienced nurse, I was uncomfortable doing the job and felt that I just had to rely on prudent nursing principles. There was no specific job description or protocol except basic ACLS. There were no specific personnel or roles on the team other than a respiratory therapist. There was no primary physician to manage orders. I had to contact the patient's physician during each event, which meant I was working with a different physician each time (when they responded). This process ate up time. My mind always raced to when could I get back to my patients, were there any new orders or changes in condition, were their medications given? I survived the transition to electronic charting, and I believe this was the straw that finally broke the camel's back for me. I changed jobs and I am happier for it! I was suddenly assigned as RN on the rapid response team, 1 hour a week during the lunch hour. I objected but did not refuse, though I was not trained and in fact had pursued an alternate career path in nursing, starting with inpatient psychiatric nursing immediately upon graduation. I never worked on a medical/surgical unit and had no clinical patient care experience. I was told that my BSN degree and current RN license satisfied the training requirement for clinical nursing. "It is reasonable to ask some nurses to fill in on RR teams, just as it is reasonable to ask an emergency room physician to assist in an in-house emergency," one nurse explained. "However, it is not reasonable to ask all nurses to do the same task. Would you want a pathologist assisting with the birth of your child? Both are physicians." One nurse said that experienced critical care nurses "should be able to work as RR nurses when needed" and offered this advice: "You will have to obtain the history on the patient, admission reason, and hospital course, if any. My next step would be to treat the patient as if he or she were my patient in the intensive care unit and make the same basic recommendations within my scope as RR nurse, such as administering oxygen, intravenous access, obtaining an electrocardiogram, and notifying the attending, or start cardiopulmonary resuscitation or code blue if needed," she wrote. "However," she added, "never work outside your scope of nursing practice." To be assigned to RR once a month or less is not optimal and may not be safe. In her article, Buppert wrote that in addition to receiving adequate training, RR nurses must use their skills often enough to stay current. "To be assigned to RR once a month or less is not optimal and may not be safe," she wrote. "An acceptable alternative would be to be put on the RR rotation once a schedule to maintain your comfort level when responding to these situations," one nurse commented. Assignment to an RR role does require specific training. At the least, the nurse needs to know what the protocols are and what can be done independently. Nurses need to remember that if they don't know the role and don't have the training specific for that role, they can refuse that role. Yes, there are consequences to refusing, but there are also consequences to taking on something you're not trained or educated to do. The Medscape article was about whether critical care nurses should be required to staff RR teams, but nurses who have been "floated" to unfamiliar units or settings (and who has not?) related to the article as well. Nurses widely agreed that floating nurses should be given assignments that reflect their skills and experience, and in some circumstances they should not be given a patient assignment at all but instead perform such tasks as taking vital signs and administering familiar medications. "I'm in a very similar situation where decisions are made with the assumption that, as long as I am a nurse, I can cover any area," one nurse wrote. "The decisions are being made by managers with non-nursing backgrounds who are looking to get the most out of nurses without providing adequate orientation. Nursing is the only profession that I know of that would allow its nurses to be placed in such a predicament." "I have been transferred from an acute setting to a long-term care unit where floating for RNs, licensed vocational nurses, and certified nurse assistants happens routinely," commented another reader. "I'm an experienced nurse of 30 years, hold a masters as a clinical nurse specialist, and still find this practice intolerable and dangerous for all. Although nursing care is not the issue, the assignments are. Nurse-to-patient ratios are 30:1." Floating to other units is a reality that often cannot be avoided, particularly in the hospital setting. Staffing needs rise and fall, and unexpected events occur, including sick calls and census changes. In the Medscape article, Buppert said that a nurse can refuse to accept an assignment under certain circumstances, including lack of sufficient orientation, inadequate staffing for patient acuity, inappropriate skill mix, and when the assignment poses a serious threat to the health and safety of the patient. Nurses in this situation should file their institution's patient assignment objection form. Buppert acknowledged that doing so may result in disciplinary action or dismissal but said that repercussions, if any, may differ for those working under a collective bargaining agreement. Buppert cautioned against first accepting an assignment and then refusing it, because this could be considered patient abandonment. On one occasion, the charge nurse gave me an assignment consisting of four patients clustered near each other down at one end of the hall, and my fifth patient was in the very last room on the other end of the hall. Her rationale was, "I want the nurses to keep the same patients they had yesterday." I refused to accept the fifth patient, stating that her decision was not in the patient's best interest, and I felt that she was compromising his care, my license, and the hospital. Was she mad? Absolutely. But after talking to the house supervisor about my refusal and my reason for it, she changed the assignment. One nurse wrote about her experience being expected to perform peritoneal dialysis without proper training. The job was thrust upon nurses with absolutely no training. Then they sent someone to train us who had no training skills at all. Peritoneal dialysis is a specialty. I feel that nurses are getting hammered with all sorts of additional duties and being told that it's alright when it isn't. Managers and administrations are causing nurses to treat patients like herds of cattle. "In this age of specialization," asked another nurse reader, "why is it expected that a nurse can float to any unit at any time? We become specialized in our area of expertise and are more proficient in the performance of our duties because of familiarity. It devalues me as a professional by insinuating that I have no special talents or abilities that I have acquired through years of working on a specific unit in a specific field." Floating can have positive effects as well, and nurses should try to approach these experiences as opportunities for learning and developing relationships with other hospital staff. One nurse was advised to be open to floating so that she would become a more well-rounded nurse. "I always spoke up and asked questions, and was received with kindness and patience from the more experienced nurses," she explained. "I was there to help them and they respected me for that. Job descriptions and duties were easily accessible on the units for every shift, so I would know what was expected of me. I find it difficult nowadays to actually find a duties list on any of the facilities that I have been to." Although many of us have had to float to other units, most of us have also been grateful for extra help when we have needed it. One reader offered, "I worked on a unit where we frequently pulled staff from other units, but I always tried to be careful with the assignment of the substitute staff member, and as charge nurse, I frequently checked on them to make sure they felt supported in every way! Also, I was sure to let them know how grateful we were that they were there with us helping us take care of our patients." One nurse said, "This article is great because it has provided the resources needed to protect yourself from supervisors who look upon staff as 'anyone who can plug a hole.' It may not prevent poorly made decisions to plug that hole, but as the nurse who is floating, you can be on record as attempting to protect yourself. Document, document, document!" Nurses working in obstetrics and pediatrics were particularly vocal. If nurses are subjected to the "a nurse is a nurse" concept, obstetric and pediatric nurses may be especially vulnerable. There is a huge difference between caring for an adolescent patient and caring for a newborn, and many nurses accustomed to caring for adults and adolescents are way out of their comfort zone when caring for babies in whom even the smallest mistake can have disastrous consequences. Although many nurses who work in obstetrics are expected to be proficient in all areas of obstetrics—labor and delivery, newborn nursery, postpartum, and even high-risk antepartum—some nurses have specialty areas within the obstetrics unit in which they are most proficient. Many of these nurses strongly objected to being floated to other areas of the hospital, such as adult medical/surgical and orthopedics, and some were uncomfortable floating to the neonatal intensive care unit (NICU), labor and delivery, and pediatrics. Would you want an adult nurse to care for your preemie baby in the NICU? One nurse wrote, "I work postpartum, and we don't take laboring patients—only stable women in preterm labor. Or we act as a second pair of hands, helping with patients or assisting with deliveries and cesarean deliveries. In pediatrics, we take the easier patients, usually those who are almost ready to go home." Another nurse added, "I work on a mother-baby floor where we also take care of high-risk antepartum patients. Not every mother-baby nurse works in the baby admission area on labor and deliver—only those who want to. Why," this reader asked, "is it okay to float to a NICU where all the babies are on cardiac monitors? I feel like a fraud going to NICU. I've been a nurse since 1983, and I don't feel safe going to NICU or pediatrics. Why do hospitals think it's okay to do this? Would you want a pediatrician to see your adult mother? Would you want an adult nurse to care for your preemie baby in the NICU?" Nurses on all sides of the situation may be able to make things easier by being proactive. Critical care nurses, particularly newly hired ones, can ask about RR responsibilities and training. It might also be helpful for RR nurses to request a 1-day or half-day orientation on units to which they might be expected to respond. All nurses can ask their employers for additional training, and although it should be provided, when it isn't, nurses can obtain it for themselves. Having additional critical care training, including the care of pediatric and neonatal patients, is a feather in a nurse's cap if and when he or she is looking for employment elsewhere. Good action points at the end of the article! Let's push our organizations for the training. Say how inappropriate it is and what the barriers are when you assume a position that you don't have any training for. Be specific. Propose a training plan; say what protocols/equipment nurses need to be familiar with. Talk with people who are long-time RR nurses. Identify issues (eg, no one skilled in drawing arterial blood gases when you evaluate a patient on the medical-surgical floor) and make solutions (develop a go-bag with an arterial blood gas puncture kit and analyzer, and all the other gear you would need). Another nurse added, "We solved this issue by asking for volunteers who would be in a critical care float pool, and float nurses were oriented to a unit similar to their own. We had an RR team. We set up a competency review for the float pool and the RR team that had to be completed yearly. We had a good turnout of nurses who were willing to be oriented and float." It is helpful to develop collaborations between units with similar types of patients, and nurses who feel comfortable floating to certain units should speak up. For example, a nurse on an obstetrics unit may also have pediatric experience and volunteer to float when nurses are needed there. Postpartum nurses with experience in adult medical-surgical or orthopedics units might volunteer to float there when needed. Nurses whose units receive help from a floating nurse can also help to make things run smoothly. Once in a while, we will be bursting at the seams, and so will our other maternal-child health units. When that happens, we are usually able to get a certified nursing assistant or licensed vocational nurse to float to us. Sometimes we will get a registered nurse, and they seem really nervous at first. When we tell them that we would never give them a patient assignment and just ask them to help out with vital signs, basic patient care tasks, and whatever they might feel comfortable with, they relax a bit. At the end of the shifts, they always tell us that they would be happy to come back and help us anytime! One nurse suggested, "When a nurse from another unit floats to our department, we only give them very stable, easy patients, with our charge nurse being a resource person and the rest of us helping out. We only take 'growers and feeders' when we float to the NICU." Another nurse stressed, "Nurses want what is best for the patient—no one is shirking their duty. Safety of the patient is the first order of business. But how safe for a patient is it when the unit does not have adequate staffing, and the floating staff member is not familiar with the unit's protocols for patient care?" Another reader summed it up with, "I love safety, I love competence, but I love stretching my abilities and being the best nurse, too—one that could handle anything. We got this, nurses! Good luck!" Have questions about floating and rapid response duty or maybe just a general question? Ask one of our Nurse Leaders!